Ever since I was a boy I wanted to write and publish a book. It took over thirty years for my dream to come true. In this post I would like to introduce the three books for learners and teachers of English which I published. Grammar Up is a book for learners of English who would like to improve their Grammar. This book contains 17 short texts which you read and then you check your comprehension. In t____ second st____ you s_____ the te______ again b____ this ti_______ half o____ every sec____ word i___ deleted. Your task is to read the text again and complete it. – * second step you SEE * text again but this time half – every second word DELETE. Your task is to read the text again and add all the missing words and forms. It might not be a bad idea to write out the text as well. I think this kind of exercise is very useful and it will help you improve your grammar. 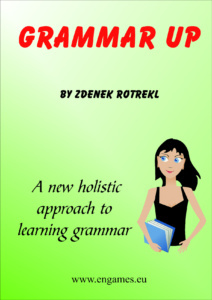 You can find more information about the book Grammar Up and a sample chapter here. 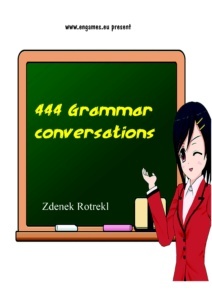 444 Grammar Conversations is a book for teachers of English. In this book you will find over 450 questions which are divided according to the grammar used there. My aim was to create a book with a set of questions for each grammar point. The teacher just comes and copies the questions and hands them to students. Students work in pairs and ask and answer the questions practising the grammar. 2. What do you do? 3. What do you do at the weekend? 4. What food do you like? 5. When do you get up? 6. What music do you like? 7. What do you do after school? 8. What does your mother do? 9. What does your father do? 10. When do you go to bed? 11. What do you do on your mobile phone? 12. What do you want to do on holiday? 13. Do you like English? 14. What sports do you play? 15. Do you like English? 16. What do you do with your parents? My last book is called High School Stories, and it contains three stories in simple English. The stories are for pre-intermediate and intermediate students and they will appeal to teenagers.